Do you want to let yourself be transported back to the New York of the 60ties? You will experience the unforgettable sound of the "Rat-Pack", Frank Sinatra, Dean Martin & Sammy Davis jr. The 10 top professionals of the band take you with them on a nostalgic musical journey with hits such as "New York-New York", "Candyman" or "Red Roses for a Blue Lady". "Gerhard Aflenzer & his Broadway Big Band" has turned itself into a musical brand-name in the past few years in German speaking countries. 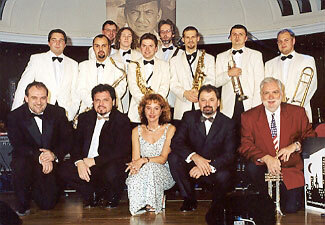 The success with the concert program "A Tribute to Frank Sinatra & Friends" brought the band numerous TV appearances and prompted Gerhard Aflenzer and his musicians to come out with "A Tribute" as CD. In addition to the regular concert appearances in Austria and Germany, the band, with its intoxicating dance music is considered to be an absolute musical highlight at many large festivals such as the Viennese Concordia-Ball, the Pharmacy Ball in the Wiener Hofburg and the Viennese Doctors' Ball. As special guests, Gerhard Aflenzer welcomes over and over beloved guest stars such as Dennis Jale - the Austrian Elvis Presley, Werner Auer, Martin Seidl, John Evers and Eva Hag as well as Werner Woehrer & Frank Main onto the stage. Gerhard Aflenzer, the "Playing Captain" of the Broadway Big Band, can already look back on eight successful years with his artists. As bandleader he has seamlessly ascended to the ranks of the great names which have led their big bands, sovereign from the trumpet stand.